Our hero has one longstanding social problem, made clear by the first few scenes. Then the story presents an intimidating opportunity to fix that problem. Then our hero commits to pursuing that opportunity and the story begins by the ¼ point. In Frozen, the story really begins when Anna sets off into the wilderness to rescue Elsa, but that seems to violate this pattern. She’s spent most of the movie before that searching for romantic love. She sings her “I Want” song, “For the First Time in Forever”, about her desire to find love, then flirts with Hans before and after the coronation, launching into the song “Love is an Open Door”. But then she has her blow-up with Elsa and immediately drops everything to follow Elsa into the mountains, seemingly forgetting all about Hans. He even offers to come with, but she says no thanks. It seems that she’s abandoning her big opportunity, rather than pursuing it. But is she actually ditching her longstanding social problem? Well, she’s ditching one of them, but if we look back, she’s had another this whole time, because she actually has two “I Want” song back to back in the opening minutes of the movie. Before “For the First Time in Forever”, she sang “Do You Want to Build a Snowman?”, in which she wanted her sister’s love. So she has two contrasting “I Want” songs, and when events force her to choose between those wants she chooses familial love (find her sister) over the search for romantic love (enjoy her new relationship with Hans). This, of course, foreshadows the end of the movie, in which she’ll make a similar choice (this time choosing saving Elsa over kissing Kristoff to end her curse), seemingly at the cost of her life, and saving everyone as a result. First of all, my daughter is named Elsa (5 years old when the movie came out) so I have also seen this film more times than I can count, and I also did not catch the closed door/open door thing. Oh well. "Does the hero discover an intimidating opportunity to fix the problem?" 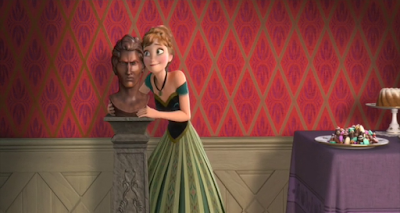 you answer this by referencing Hans, but perhaps since, as we will learn, the "real" story is the Elsa-Anna relationship, the intimidating opportunity is the chance to talk with Elsa at the coronation, immediately ratcheted up by Elsa's fleeing. But whoa, as I'm writing this, I'm realizing that there's a problem - she seemingly abandons this whole goal after getting hit by the magic and chased by Snowball. Do we ever have a sense of what Elsa's plan is *after* she is cured? Presumably she'll try again with Elsa, but this all get short-cutted by the Hans plot-machinations. This is a pretty funky structure now that I'm thinking about it. So it seems like there are two separate structures, which both more or less conform to your checklist, but pieces of each of them are truncated (especially the "committing to the hard way). Basically, Part 1 of the movie develops both problems. Part 2 is devoted to problem 1 (seemingly abandoning problem 2), Part 3 is devoted to problem 2 (seemingly abandoning problem 1), and then the Part 4, the climax, brings them together again. In a different sort of movie, you might have been able to weave these together more fluidly (perhaps by letting Hans come along? but that poses all sorts of problems for how to get Kristoff on board). But my sense as a viewer is that this all works perfectly. This dual structure also changes your answer to "Before the final quarter of the story begins, (if not long before) has your hero switched to being proactive, instead of reactive?" In problem 1, the entire second quarter of the movie is Anna acting proactively/impulsively to solve her Elsa problem. 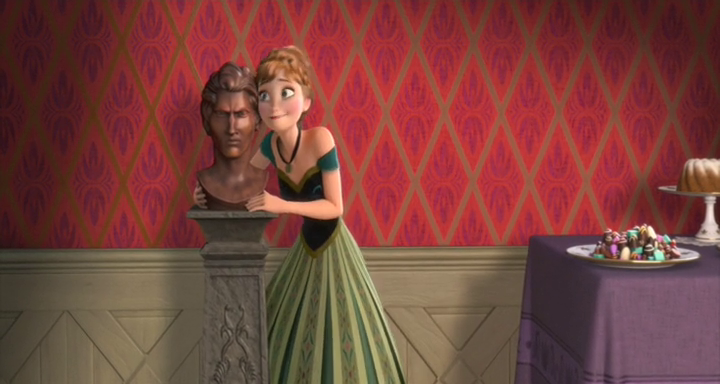 In problem 2, she is more reactive (to Hans, to Elsa's rejection of Hans, etc. ), but it is somewhat difficult to gauge her proactivity considering that she is weakening consistently through the third quarter. 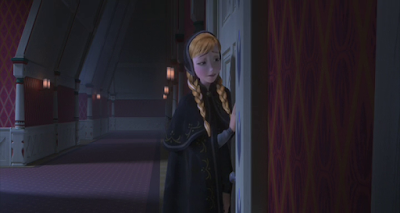 I think you could argue that she is attempting to make proactive choices - get to Hans, get out of the room she's trapped in, get to Kristoff, but she's lost so much power that she need Olaf and Kristoff to help her achieve these goals. So, a weird structure - have we seen anything like this in other movies? It seems likely, but I can't think of one off hand. I totally agree with your analysis. It's such a weird movie! Just look at the plot synopsis I put on top of the checklist: It sounds like an incoherent mess, despite the fact that I've seen the movie 20+ times. And yet it's pretty much a perfect movie. I feel like these two social problems are really one and the same: loneliness. That's what most of "For the First Time in Forever" is about: "For years I've roamed these empty halls;" "There'll be actual real life people." It's not until the end of the song that she works up to a romantic theme. For most of her childhood Anna tried to end her loneliness by luring Elsa back into a relationship with her, but now she's given up on that, at least enough to pursue the alternate solution of falling in love. Ultimately, though, she cares more about Elsa, which lets her run off into the mountains as soon as she realizes the trouble Elsa's in.